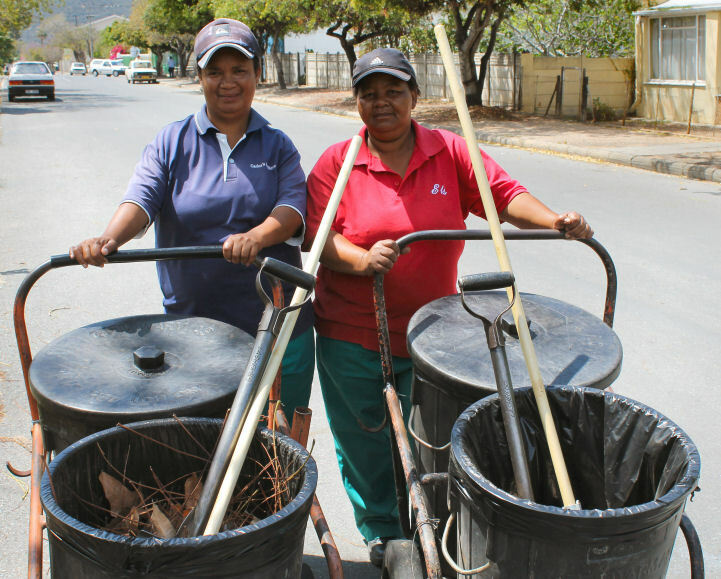 Since these hardworking ladies took on the job of cleaning Montagu's streets a good couple of years ago (they have been working for the Municipality for 8 years), it was immediately evident that a new thoroughness had crept in! Even more so today. When asked if there is any part of their job that they really don't like, they said - almost in unison - "when people mess so unnecessarily! Sometimes they are a meter away from a rubbish bin and they are too lazy to walk just a step or two to dispose of their rubbish!" If required, they don't stop at 1pm on Saturdays, as inevitably after a busy shopping day the CBD area is a proper mess! They are often seen sweeping until late in the afternoons on Saturdays. One does not often see them leaning on their brooms and nattering the time away ... they have a job to do they say! There are times that they also have to join the men on the refuse collection truck when they are short of manpower on any particular day - which they don't mind. "When a job needs to be done, they all need to get stuck in!" If you see these ladies hard at work as you drive past, a kind word of appreciation goes a long way!